Apple Planning Dual-core and Quad-core iMacs? NetApplications HitsLink have posted Operating System Market Share stats for January, 2009, showing the Mac OS more market share ground on Windows during the month, reaching another high-water mark for the 21st Century. Windows dropped below 90% in November, '08 and has stayed there, dropping roughly another half-point over the month while Linux's share dropped very slightly back to where it was in November, '08, and remains below one percent while the iPhone version of OS X was up slightly. Comparing longer term, at 88.26% Windows is down more than five percentage points since May 2006 (95.09%), while the Mac OS at 9.93% has more than doubled its share over the same interval from 4.43% in May '06, while Linux has also more then doubled its May '06 numbers from 0.40% to 0.85%..
Moving on to browsers, the Firefox browser exceeded 20% share in November 2008, gained more ground in December, and squeaked out a tiny gain again in January, while Safari gained more than half a point of share in December and another third of a point or so in January. Internet Explorer continues to fade. Google's newcomer (and so far Windows-only) Chrome has nailed down more than 1% of the browser market. "Apple's rotting retail sales will taint the electronics food chain. "...folks still need a place to go, even if they're broke, which might explain the relatively strong foot traffic that Apple 's 250 or so retail stores - 43 are in California - still seem to enjoy. But as a former editor once preached when I covered the retail beat: 'Always watch the registers.'" "...same-store revenues, a key retail metric comparing sales of stores open for at least a year, slid 17.4% in the December quarter from a year earlier, reports Needham hardware analyst Charlie Wolf." "Considering the hefty price-points of iMacs and iPhones, it's little wonder that Apple's highly successful retail store operations 'fell to earth' in December...."
"Apple this week is advising members of its reseller channels that supply of iMacs will be constrained in the immediate future, a move that may signal new models are nearing production. "In particular, people familiar with the matter say the Cupertino-based Mac maker has warned that new reseller orders for the high-end 24-inch 3.06 GHz iMac are unlikely to be fulfilled, suggesting manufacturing of that model is ramping down or has already ceased. "Additionally, Apple is said to have braced its partners for limited availability of the remainder of the iMac line in the coming weeks, a sign which this late in the product's life-cycle 'only means one thing' - namely that the company is drawing down inventory levels ahead of new models...."
"Apple may be using both quad-core and dual-core chips in a new iMac expected soon. "Rather than choosing between dual-core or quad-core processors for an expected revision to the iMac, Apple may have decided to use both. "Shaw Wu of Kaufman Brothers, who just last week opined that an iMac refresh was around the corner, thinks Apple has resolved its dilemma over using quad-core or dual-core processors for the new systems by creating two tiers in the iMac line: a high-end version with a quad-core chip, and a low-end version with a dual-core chip...."
Link: Apple Planning Dual-core and Quad-core iMacs? "Apple Inc. appears set to introduce an updated version of its iMac desktop computer, as the company seeks to reinvigorate a key product line amid slumping industry-wide desktop computer sales. "One indicator that Apple's set to upgrade something is inventory of the present-day version disappears, or becomes very hard to find...."
"New Xeon processors widely believed to be candidates to power a next-generation Apple Mac Pro will go on sale in late March, according to a new report. "Fudzilla.com is reporting a Sunday, March 29th on-sale date, with the chips becoming more widely available the next day. While their report doesn't cite any sources, the news does seem to jive with an earlier story about the new Nehalem-based Xeon chips arriving in 'early 2009'...."
"Still, it will take some digging and the final solution is far from Mac-elegant. "The Seagate Knowledge Base document is titled Firmware-Empfehlungen fr die Festplatten Barracuda 7200.11, ES.2 SATA und DiamondMax 22 ." "DRAM chip prices soared in Asia on Monday after traders returned from the week long Lunar New Year holiday in China and Taiwan and faced up to supply chain concerns after chip maker Qimonda's bankruptcy filing. "The price of the benchmark chips, 1-gigabit DDR2 (double data rate, second generation) DRAM chips that run at 667 MHz, rose 27 percent to US$1.08 each, DRAMeXchange Technology reported at 6 p.m. in Taipei. DRAMeXchange runs an online chip clearinghouse. "In the short term, prices will likely continue to rise . . . Anyone who needs to buy more DRAM might want to wait, though, because in the longer term prices will likely fall again...."
"Apple has always been about moving forward, about pressing customers to buy the latest and greatest . . . Most Apple fans more or less accept this planned obsolescence without question, but the company may have just gone a little too far. "iLife 09 has recently been released, and among all the excitement about the new release, as well as the hubbub surrounding Steve Jobs' health, it was relatively easy to miss the alterations in the system requirements for the new iLife suite: one of the most significant iLife 09 features now requires an Intel dual core machine. "Learn to Play, the feature where major artists like Sting . . . teach iLife users how to play their songs via Garage Band, requires at least a dual core Intel Mac - leaving not only PowerPC G4 and G5 owners out in the cold, but also the newer single core Intel machines . . . it seems like the company is just a little too eager to ditch the PowerPC chip...."
Editor's note: iLife 09 requires an 867 MHz G4 or better and 512 MB of RAM - the same exact requirements as Leopard, which it also requires. It does not require Intel Core Duo. iMovie 09 requires a 1.9 GHz G5 or better, and Learn to Play is the only component that requires Intel Core Duo or better. "A cross-platform strategy is bringing Macs further into the fold at RAND. And the think tank isn't the only enterprise going in that direction, thanks to lower Macintosh prices, the wave of enthusiasm surrounding Apple's consumer products and disenchantment with Microsoft's Windows Vista operating system. "Spurred by renewed popularity of Apple products, many enterprises are taking a fresh look at the Apple Macintosh platform. The result: an unmistakable uptick in enterprise Mac deployments. "The Mac rebound at RAND is aided by the organization's cross-platform end-user strategy that affords equal stature not only to Macintosh and Windows, but to Solaris and Linux." PR: Envato have today launched AppStorm - a new website dedicated to Mac application news, reviews, competitions and tips. Aimed at both the casual and professional user, AppStorm provides a central resource for discovering independent Mac applications. Regular articles will take the form of application reviews of a wide range of indie Mac software, and how-tos explaining how to make the most of software you already have in innovative new ways and more. Envato have today launched AppStorm - a new website dedicated to Mac application news, reviews, competitions and tips. Aimed at both the casual and professional user, AppStorm provides a central resource for discovering independent Mac applications. PR: Alesis, a leading manufacturer of professional audio equipment and studio electronics, announces that TapeLink USB, a digital-archiving cassette tape deck, is available now. This dual-cassette deck enables musicians to store their irreplaceable recordings on hard disk or flash, burn them to CD or take them on the go on their iPod. 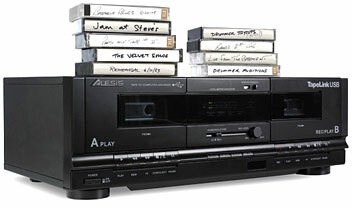 Musicians can clean up their old tape recordings of band rehearsals, performances, demos, jam sessions and song ideas. TapeLink USB is a dubbing and playback deck that connects directly to a computer via USB. The plug-and-play USB-audio interface requires no drivers for use with most computers. TapeLink USB's CD-quality 16-bit, 44.1 kHz audio output accurately captures tape recordings for secure digital archival. Normal and high-speed dubbing modes save time when copying music, while dynamic noise-reduction circuitry and Alesis' software suite assist in cleaning up aging tapes. TapeLink USB works with metal and CrO2 tapes and contains an LED level-meter for visual level reference. Full auto stop saves irreplaceable older tapes from breaking. TapeLink USB comes with a software suite containing three applications. EZ Tape Converter makes transfer simple and convenient, Audacity audio-editing software enables musicians to edit their audio files once they've been transferred and BIAS SoundSoap professional noise-reduction software removes hiss, room noise, rumble, hum and other background noise. "Many musicians have stacks of tapes in their basements, from studio rough mixes to song demos and rehearsal tapes," said Adam Cohen, Director of Business Development, Alesis. "TapeLink USB gives them a way to restore and reconnect with those old recordings." PR: GainSaver, an online reseller of used Macintosh computers, has announced the launch of its new Daily Deals sales promotion. Every day a new selection of Macintosh systems is discounted an additional 10% for one day only. This allows shoppers to save even more on the huge GainSaver inventory of iMac, iBook, MacBook, MacBook Pro and Mac Pro systems. Orders must be placed by 10PM PT to qualify for the Daily Deal. With the current state of the economy, people are looking to save money. Because the Macintosh is well known for years of reliable service, used Macintosh computers are very popular with families, students, designers and business users. "The complete Macintosh system customized by the client is discounted 10% at the time of checkout" said Steve Harper, director of sales at GainSaver. "All system components are included in the discount, so the bigger the system configuration, the greater the dollar savings." With over 20 years of experience in the Apple market, GainSaver is a leading supplier of used Apple Macintosh computers. The GainSaver online store also carries new, used and refurbished PC systems from top PC manufacturers such as IBM and Dell. In addition, GainSaver sells more than 30,000 different electronics products. Sales lines are open from 7am to 5pm PT. PR: Many Apple fans were saddened and frustrated by Apple's decision to drop the free iCards service from MobileMe. However Ohanaware has just enhanced an excellent substitute with the release of an update to their FREE product, "Fun Card Maker". 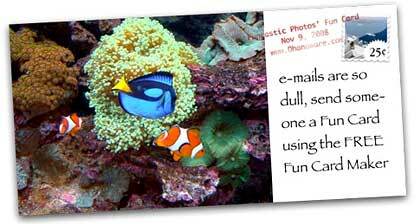 Fun Card Maker allows people to send ecards over e-mail, just like iCards did. This latest update adds requested functionality to the product. Ohanaware's Fun Card Maker is a user friendly software product, that is designed to make it simple to create exciting virtual greeting cards for distribution over e-mail. Recipients of Fun Cards will be able to view the greeting within their favorite e-mail program, regardless of whether they're using a Macintosh or Windows PC. As of February 1st, Fun Card Maker has been download over 100,000 times since it's release in September 2008, making Fun Card Maker one of Ohanaware's most popular products. The latest version of Fun Card Maker adds the most requested feature to Fun Card Maker, the ability to specify the text size of the caption. This ability allows users to set the text size really small to include a longer message, or to specify a larger text size and include a more to the point greeting. Fun Card Maker requires a Power Macintosh G4, G5 or Intel based Macintosh computer, running Mac OS X 10.4 or later. It is recommended to have to least 128 MB of RAM. Fun Card Maker is available today for free. Fun Card Maker can be downloaded and used for FREE from the Fun Card Maker web page on the Ohanaware web site. PR: Computer Glasses is a freeware utility that lets you magnify a portion of the screen to read fine print or magnify an image. Above is what you see when you launch Computer Glasses. When you click in the circle and start to drag it, you will see crosshairs that you drag to the middle of the area to be magnified. A Control Panel lets you select the magnifier shape (Circle or Rectangle), the magnification (Slight, Medium, Larger and Largest), set the magnifier size with a slider and Hide/Show the magnifier. The Shape (C for Circle, R for Rectangle) and size (width x height) are shown in the Control Panel title bar. When you are satisfied with the settings, click on the arrow to shrink the window. Now, you can drag the Control Panel window out of the way on the desktop. You can also minimize the Control Panel to the Dock. Control Panel settings and location are saved between sessions. Magnifier position is saved between sessions and between Hide/Show views. You can quit the application by clicking on the Control Panel's (red) close button or by clicking anywhere on the Control Panel and using the Computer Glasses>Quit Computer Glasses from the menu bar. PR: DEVONtechnologies, LLC releases the second public beta of version 2.0 of all editions of its information manager DEVONthink as well as of the smart note-keeper DEVONnote. The second public beta of DEVONthink 2.0 and DEVONnote 2.0 adds a number of new functions as well as fixes for bugs and glitches. PDF (DEVONthink only) and text files can be split and merged and PDF pages can be copied and pasted from one document to another. RSS feeds are updated much faster using multi-threading and a new RSS preferences panel allows you to customize how DEVONthink Pro handles RSS feeds. Any document can be easily sent by email directly from within the application and the smart group editor as well as the sidebar have been further completed. The support for file types containing PDF or HTML previews has been improved and a number of scripts and bookmarklets have been updated. DEVONthink Pro Office now supports QuickLook-based previews in its web interface, shows PDFs also in browsers other than Safari, and divides long item lists into pages for better performance. The Sorter creates web archives also from OmniWeb and Firefox and names documents more reliably. Email archiving is faster, too. Finally, converting databases and exporting files is more reliable now and the overall reliability has been improved. The version 2.0 upgrade addresses a large number of feature requests from the active user community and modernizes almost every aspect of the applications. These public betas are still incomplete but the already existing functionality is stable enough for sharing with the public. Smart tags, a fully functional sidebar, PDF annotations, enhanced image editing as well as the ability to upload files through the web interface are not implemented yet but will be delivered one after the other with each subsequent update. The user interface of all editions will be further polished, too. DEVONthink 2.0 imports and displays Microsoft Office (Word, Excel, PowerPoint), OpenOffice and iWork (Pages, Numbers, Keynote) files as well as Skim PDF packages and all other files that support or are supported by Mac OS X 10.5's QuickLook. Using Spotlight importers and plugins for indexing DEVONthink can also search files that it cannot display due to the lack of QuickLook support (Spotlight does not need to be active). Metadata, e.g. from PDF files, email messages, or Office documents is imported, indexed, displayed, and can be selectively searched, e.g. using smart groups. DEVONthink 2.0 allows to create documents from templates and DEVONthink Pro Office 2.0 shares databases with other users on the local network or over the Internet via an interactive web interface based on the latest web technologies. RSS, RDF and Atom news feeds can be added as self-updating groups to any DEVONthink Pro database and so integrate live content with local documents. The independent 'Sorter' panel lets the user add data to your databases even when DEVONthink Pro is not open. Tabbed browsing and editing as well as Cover Flow simplifies working with large numbers of documents. A PDF sidebar allows rearraging and deleting pages. 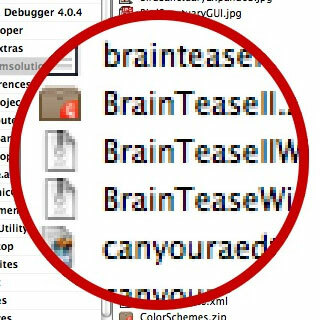 The new database engine incorporated into DEVONthink 2.0 not only speeds up working with large databases but also stores all files in their original file format, e.g. Microsoft Word files and email messages. Files are no longer converted when imported and can be edited using external applications. In addition, all documents can be accessed from outside DEVONthink using a standard URL. This highly improves workflow integration with third-party solutions such as iCal, OmniFocus Daylite, Bookends, or Endnote. DEVONthink Personal 2.0 and DEVONnote 2.0 inherit the three pane view formerly exclusive to the Pro editions as well as separate document windows and the full screen mode. In addition DEVONthink Personal is no longer limited to 10,000 images. The public beta releases of DEVONthink Pro and Pro Office 2.0, DEVONthink Personal 2.0, and DEVONnote 2.0 require Mac OS X 10.5 or later and can be downloaded from from their website. DEVONthink and DEVONnote can be test-driven for free for 150 hours of non-continuous runtime until they need to be properly licensed. The public beta releases run without registration until March 31, 2009, before they need to be replaced by new betas or the final 2.0 releases. 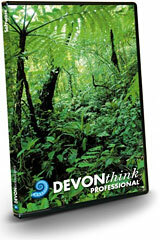 DEVONthink Professional Office sells for $149.95 (USD), DEVONthink Professional for $79.95 (USD), DEVONthink Personal for $49.95 (USD), and DEVONnote for $24.95 (USD) in DEVONtechnologies' online shop. DEVONthink Pro Office and DEVONthink Pro are also available with the Internet research agent DEVONagent as bundles. Users who purchased DEVONthink Personal, Pro, Pro Office or DEVONnote 1.x on or after July 1, 2008, are eligible for free upgrades. Users who have purchased before the grace period will be able to upgrade for attractive upgrade prices available on the DEVONtechnologies website.